L.A.C.E.S. 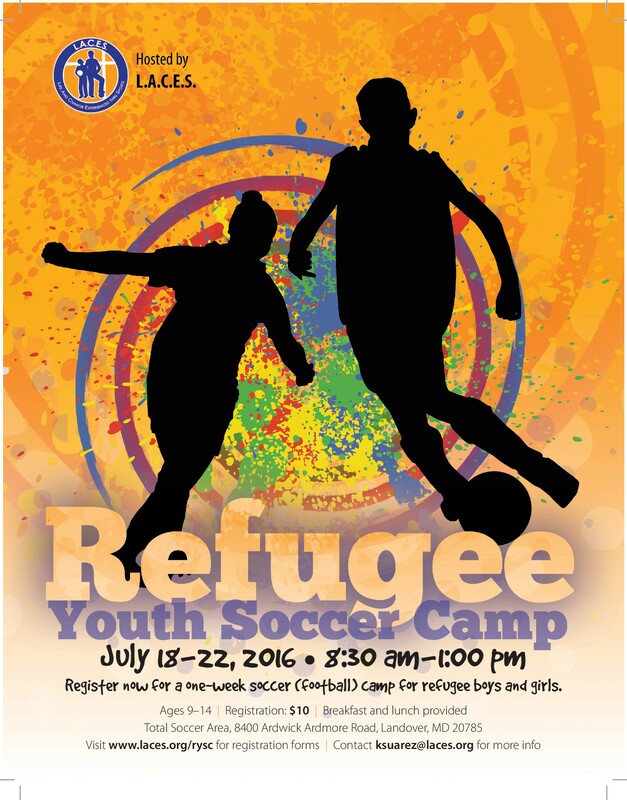 is proud to announce the launch of its first Refugee Youth Soccer Camp this summer! The one-week camp will host 60 boys and girls age 9-14 predominately from the greater D.C. refugee community. The camp will be held from July 18-22 2016, from 8:00am to 1:00pm at Total Soccer Arena: 8400 Ardwick Ardmore Rd. Hyattsville, MD 20785. Children from different countries and languages will gather together through the uniting power of soccer. The goal is to encourage children’s self-esteem and team-building capacities, while promoting social inclusion and cross-cultural exchange. For the duration of the camp, L.A.C.E.S. will provide the children with 2 meals per day, a soccer ball, water bottle, t-shirt, wristband and gifts. Furthermore, transportation will be provided daily from Parkview Garden Apartments in Riverdale and King Square Apartments in Hyattsville, where the most of the participants live. Led by Camp Director Mike Eckberg, Assistant Coach for Towson University’s women’s soccer team, experienced coacheswill train both individual and collective soccer skills, organized games and educative activities in a safe and fun environment. This camp represents the first step in L.A.C.E.S. involvement with the local refugee community. For the coming future, L.A.C.E.S. is planning to hold one-day camps, for example during school holidays. The goal is to provide continuity to the program, strengthen and expand the group, help the parents take care of their kids during holidays and define new strategies of intervention. – Local leadership: We believe that each community know the best way to address the social issues that our children face. Through ongoing training, we empower locals to create their own change. – Community Engagement: L.A.C.E.S. partners with the community to identify the most vulnerable children. In Liberia, since 2007 L.A.C.E.S. has been working with 1200 children, 180 coaches, 20 Liberian staff in 5 communities. Our work is focused on families fostering children who live on the street, schools providing scholarships to children who cannot afford it and the creation of platforms to address social issues such as Ebola. In the United States, L.A.C.E.S. is engaging with the refugee community of the greater DC area. The purpose is to promote children’s social inclusion through the uniting power of soccer. This will help them overtake cultural barrier and to find fun and safe environments where to interact with other children.